Newsletters in Customer.io are different than traditional "list-based" newsletter tools, in a few ways. The first step of setting up your newsletter is defining the recipient list. You can send to all the people in your system, or you can define a smaller segment to send to. For each recipient option you should immediately see how many people will be sent the email as well as see a few sample matching users. Note: this preview includes unsubscribed users, so the actual number of sent newsletters may be smaller than the preview. If you select a newsletter send as a condition, you may see a green or yellow dot on the newsletter icon. This is a "status" indicating whether the newsletter has been sent (green) or drafted (yellow). This will attempt to send to every person in your Customer.io account. Some people may not currently belong to a segment or have a specific shared attribute that makes them easy to target using a data-driven segment. If you know their IDs or Emails, though, you can send a newsletter to them by uploading a CSV in a manual segment. 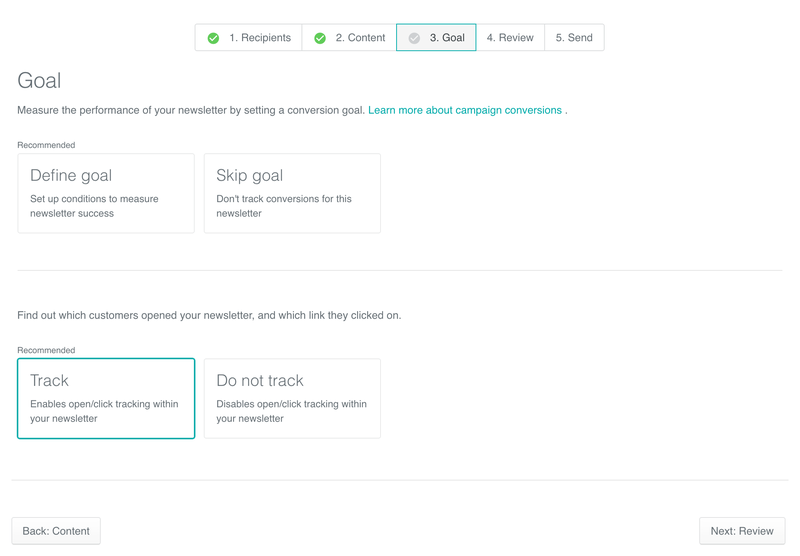 In the Goal section of the workflow, you can set up a conversion goal, as well as decide if you want to track opens and clicks (on by default). Within the message composer, you can define different from addresses, reply-to address, and even change your To address to go to something other than the default "email" attribute. This option will override the Customer.io default. We ask that you be careful when doing this. Continuing to email someone who has unsubscribed could result in your breaching anti-spam laws in your country, and we do reserve the right to terminate your account if you do so. Then you'd create your segment and send newsletters to it. Newsletters can be both sent immediately, or scheduled for a future date/time. To schedule in advance, you'll click schedule, and choose your date and time! Always schedule at least 5 minutes in advance, and note that the timezone defaults to your local time.